A lot happened in the drone industry in 2016, the sector is definitely maintaining a fast growth rate. As more aircraft fills the sky, the need for security is greater than ever. Regulations are loosening (more permitting but often requiring more paperwork) in some countries (France, USA). It is more possible to work with your drone but in return the regulators ask for better security, which is quite understandable and logical. This often includes flying restrictions near airports, above people, roads, railways, etc. Additionaly, some countries requires to have a parachute reducing the energy upon impact at a defined number of joules by whatever mean you like. It could be an airbag for example but the best known way yet is to add a parachute. A really simple, easy to install and lightweight parachute. It does not require any heavy modication of the drone. The parachute is really huge, that's the 58" (for 58 inches in diameter) that you can also find in the MARS 58 V2. The parachute has an area of 1.71m² (18.4ft²) and can slow the 3DR Solo down to 3.8m/s (12.5ft/s), reducing the energy upon impact to 12.5 joules, far less than the 69 joules required by French regulations for example. That's the biggest novelty of 2016, the Mayday by NorthUAV is an electronic board that can trigger the ejection of any PWM controlled parachute. 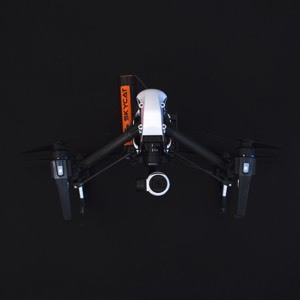 It uses sensors such as accelerometers, gyroscopes and a barometer to know when the drone is falling and needs a parachute. The system often trigger faster than a human pilot (especially when flying Beyond Line Of Sight) and it can learn how you fly and when not to trigger even if you are flying aggressively). You can still bypass and trigger manually. 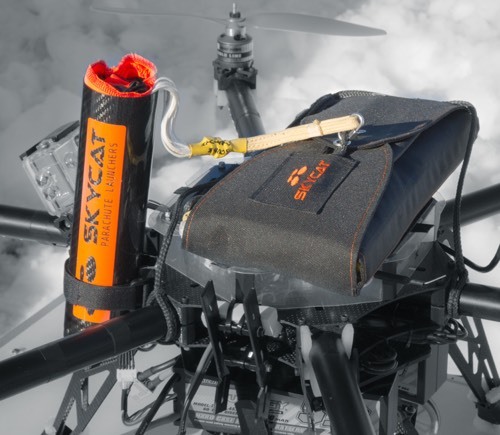 A productive year for Skycat who had maybe 2 or 3 parachutes in 2015 and developped a whole range of products for UAVs "from 1 to 40kg". Some of the new products are adapters for their X48, X55 & X68 launchers, all featuring the tried and true, patent-pending, Skycat FUSE® trigger. 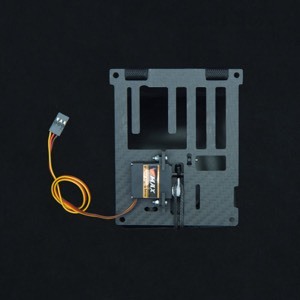 You will find adapters for the DJI Inspire 1 and for the good old DJI F550 frame. 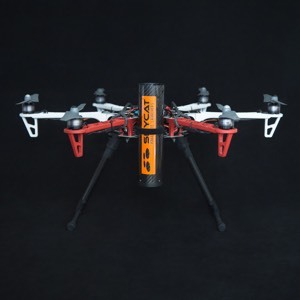 Skycat have been hard at work in 2016 and also released new "Hobby serie" with more conventional launchers, thus reducing the cost but you can clearly see that a lot of thought have been put through these products and they have lot of interestinf features: can be mounted on lot of differnet drones (multirotor or fixed wing), power loss on servo won't accidentally release the parachute, choice of differnet parachutes, works with your own receiver, lightweight. This concept has been nicely adapted to the DJI phantom 3, it weighs 140g-150g (depending on the parachute you choose) and should slow the fall 4.1 m/s, for an impact energy of 12 joules. 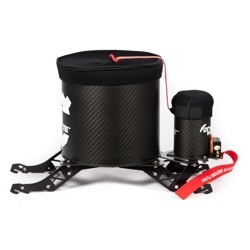 Last but not least, the XL PRO form Skycat is for serious business, it can fit a drone with an AUW of up to 40kg and still slows its descent to a steady 5m/s. A pilot/main chute combination and flat folded main parachute allows the parachute to dpeloy correctly even upside down. 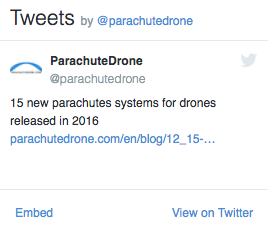 Opale Paramodels released a bunch of new parachutes for drones with a new technology claiming a deployment under 0.8 seconds. 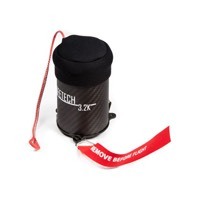 Their technology puts no constant pressure on the parachute thus reducing the wear. 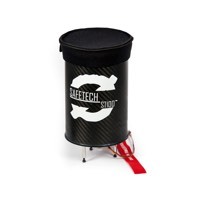 The ST160 comes with a pilot chute and a main chute, each in its own launcher/container. it comes in two versons, one with a 12m2 parachute for aircrafts up to 25kg and another with a 15m2 parachute for aircrafts up to 40kg ! 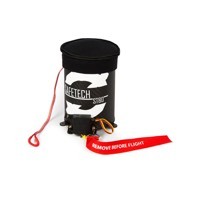 These parachutes are still quite lightweight, just above 1 kg (1020g & 1130g). Opale also released two new parachute for specific drones, DJI drones of course, with almost 70% of market share in the prosumer industry that's a non brainer. 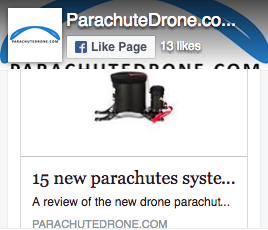 No parachute for the sucessful Phantom though but one for the Matrice M600 and another for the DJI Inspire 1. 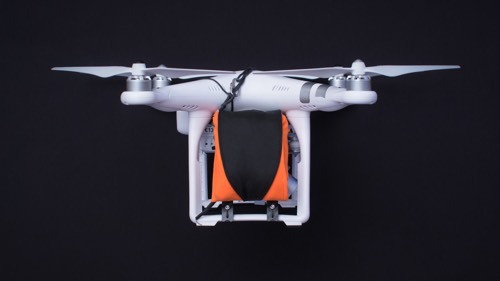 One of the main drone reseller in France released their own parachute, after a successful 1st version for the Inspire 1, the new one is made specifically for the Inspire 2 and based off of 2 Rebel Space canisters. 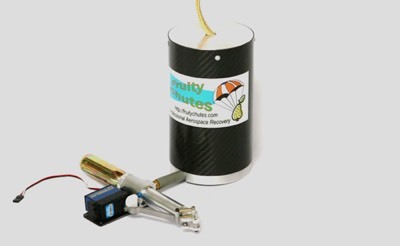 The parachute canisters are removable in less than a minute if not needed. The systme is also comprised of a kill switch, a loud alarm and a dedicated remote, everything needed to comply with French regulations. 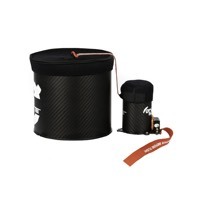 This parachute for DJI Inspire 2 is said to be effective from 15 meters (50 feet) AGL and weighs 350g (12oz). 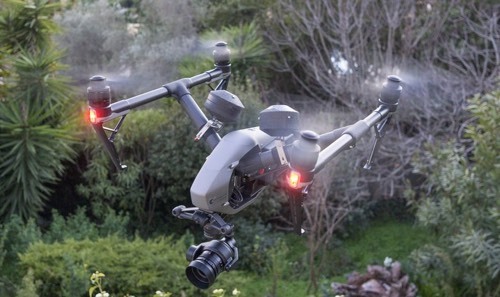 This is not a system anyone can install themselves (mosty due to the kill switch) and it actually requires you to send your Inspire 2 to Flying Eye, they'll install it for you and send it back. Always improving their peregrine IDS system. They've been working on it since 2012 and refining the solution. 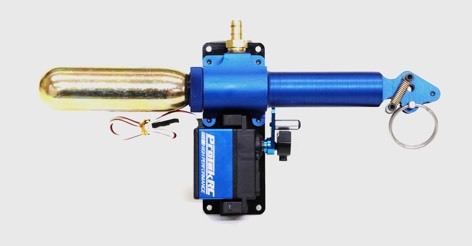 The CO2 actuator is now a stand alone unit andno longer integrated with the parachute system, it can use commonly available CO2 cartridges & the aluminium andcarbon parts are lighter. But the best part is the new Hawk CO2 System. Its predecessor used a small pyrotecgnic charge (Pyrodex or Tripple Seven) to fire a piston into the C02 canister but this kinf material isn(t always easy to find). The new system ues a spring instead and is still very fast and it is also a beatifully CNC machined piece of aluminium. It works with CO2 cartridges available wormdwide (no problem if you want to travel with your drone and parachute).